EVP Systems the Hit of San Diego! For the two days of the Southern California Estate Tax and Planning Forum in San Diego, the one booth that everyone had to visit was Estate Valuations & Pricing Systems'. It was where you got the cool t-shirts. 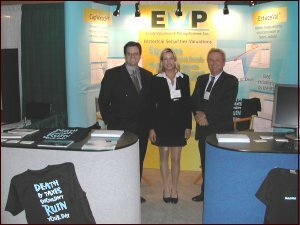 The run-away hit of the show, EVP's "Death & Taxes Shouldn't Ruin Your Day" t-shirts were snapped up by conference-goers and vendors alike. One EVP client summarized the general opinion with a succinct, "This is so cool!" But the attendees weren't just stopping by for all the free casual wear. 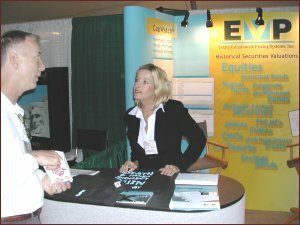 The latest version of EVP Office -- released the day of the show -- also impressed visitors, and hundreds of CDs were given away. Existing customers got the newest upgrade and potential clients got a convenient way to learn about the best historical securities valuation software there is. "We love your program. I use it every day." -- Janice C.
"You guys are great! Thank you!" -- Robert M.
"Can I have a t-shirt for my paralegal? She uses the software and thinks its wonderful." -- Brad F.
If you couldn't make it to San Diego, never fear: You can always get the latest release of EVP Office -- as always -- from http://www.evpsys.com/software/. And if you'd like a t-shirt, well, we've got plenty left and are planning a few surprises. Be sure to check your October invoice. See you at Heckerling in January!